The following folks showed up at Rogers today: Terry, Ted, Mike, Ron, Sanford, and me. By the time I got there, Terry had gotten out the vehicles and they were under a tree and the aircraft were pulled out. After some effort, the Bleriot engine was started and I think the consensus was it was running great once adjustments were made. 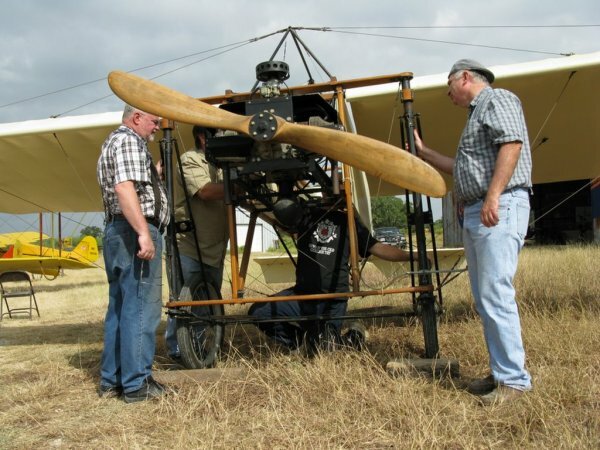 A lot of tweaking on the Bleriot was done by Mike, Roger, Ted, and Terry getting her at least taxiable for the show and I think that succeeded. The Canuck was next and significant tweaking was done by the same guys mentioned and I think it has passed final muster for the airfare except for needing a bath in the area of the rear decking and horizontal stabilizer which were bird bombed. The Bleriot looked pretty clean. Ted, I think, alone gave the cub some exercise. Ron and Sanford were extremely busy all day. First thing they tackled was getting the Indian tanks prepped for painting, lots of sanding and cleaning. Roger with Ron's assistance later in the day painted the tanks, they look great. Next step will be to have a painter get the detail work done for the Indian logo on the tanks and the pin-striping. I don't know if Roger is putting more coats on the tanks. Hopefully the tanks will be mounted on the 18th. Sanford and Ron, and I think as Ron concentrated on the tanks more Sanford moved over to continue the work on the DVII nosebowl. It is starting to look very sharp and may be approaching the painting stage.